CUCU ABANG GODAM: Jorge & Ducati: How Will It Go? Jorge & Ducati: How Will It Go? Who knows why Jorge Lorenzo and Yamaha have had a falling-out – maybe we’ll find out when we get to Motegi, or maybe we won’t. The factory’s decision to allow its three-time MotoGP champion to test with Ducati just once before the winter testing moratorium suggests that the two have had a squabble and this is Yamaha’s way of rapping his knuckles. And, in hindsight, I’m even less surprised considering a brief chat I had with a senior member of Yamaha management at Aragon three weeks ago. This was after Lorenzo had reemphasised his dissatisfaction with Valentino Rossi’s Misano manoeuvre. What do you reckon to Jorge’s opinion, I asked the Yamaha man. “It’s ridiculous," he said, raising his eyes to the heavens. At the time I was slightly surprised he had been so open in his contempt; now it all makes sense. So they’ve had an argument. Big deal. Arguments happen all the time in MotoGP – on the track and off it. As a result Lorenzo will be allowed to ride Ducati’s Desmosedici at the two-day post-Valencia tests but won’t be able to take part in a Ducati test at Jerez later in November. Yamaha is quite within their rights to do this. Rider contracts run from January 1st to December 31st, so in fact they are doing him a favour allowing him to ride at Valencia. True, it’s now the norm that riders are released early from contracts so they can join their new teams at Valencia, but something’s obviously gone wrong here and this is the consequence. 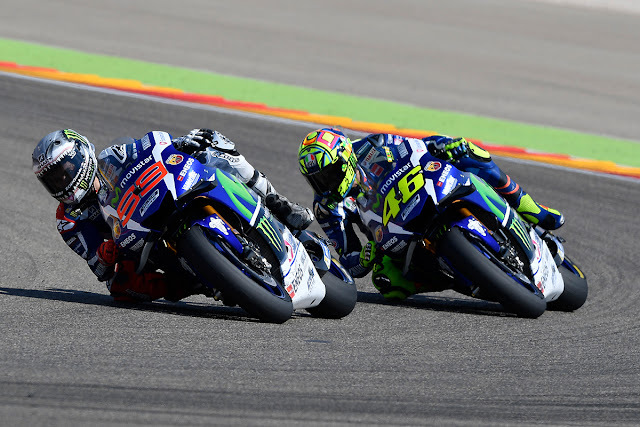 Inevitably, some paddock outsiders swear they can see the hand of Valentino Rossi in these events. I don’t. Most important of all, does it matter? Not a lot, unless the Valencia tests are washed out. All that really matters is that Lorenzo gets a couple of good days on the bike, so that Ducati have enough data to help them find a direction for next year’s first tests at Sepang in late January. Tiff or no tiff, you could argue Lorenzo has chosen the perfect moment to leave Yamaha, who haven’t won a race since Barcelona, their longest victory drought since 2003, the year before Rossi joined them. 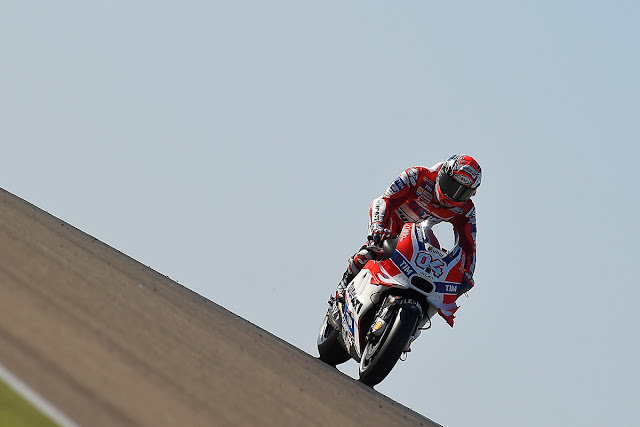 But will the 2010, 2012 and 2015 champion be better off on a red bike than a blue bike? Ducati’s outgoing rider Andrea Iannone believes the Spaniard will be a title contender in 2017. “Jorge will have a very strong bike that is ready to fight to win the world championship,” he says. Incidentally, for those who question Ducati’s sanity in letting Iannone go and keeping Andrea Dovizioso, think a little deeper and consider this: how would you cope with Lorenzo and Iannone in the same team? I think that would’ve got very messy, very quickly. It will be interesting to see how Lorenzo fits the Ducati. Probably more than anyone else on the grid, he needs an inch-perfect bike in order to exploit his inch-perfect riding technique – he is the Max Biaggi of today. I recall the closing stages of the 2001 500cc world championship, when Biaggi and Valentino Rossi fought to be the last 500 world champion. Biaggi and his Yamaha YZR500 were catching Rossi and his Honda NSR midseason until the Roman had a series of front-end crashes. He blamed everything on Yamaha, to the extent that Yamaha believed him. They even called a press conference during which we sat agog as they accepted responsibility for losing the championship, even though we knew the problem was Biaggi’s riding technique. He always rode a 500 like it was a 250, just as Rossi did, until crew chief Jeremy Burgess told him to adapt to the bike. Iannone says the Ducati now has good front-end grip, so maybe Lorenzo won’t end up like Biaggi, if he can get the settings 100 per cent right. But it will be interesting watching him adapt, especially because this year he’s been undone by the tyres, not the motorcycle. Lorenzo won his first MotoGP races with Michelin in 2008, then over the next seven seasons adapted his technique to Bridgestone’s ridiculously good front. The difference between these front tyres is huge. “When a rider first used the Bridgestone front he would always say the bike doesn’t turn, it’s heavy like a truck,” explains Cal Crutchlow’s LCR Honda crew chief Christophe Bourguignon. “When the rider understood he had to load the front tyre much more, then the bike turned better. 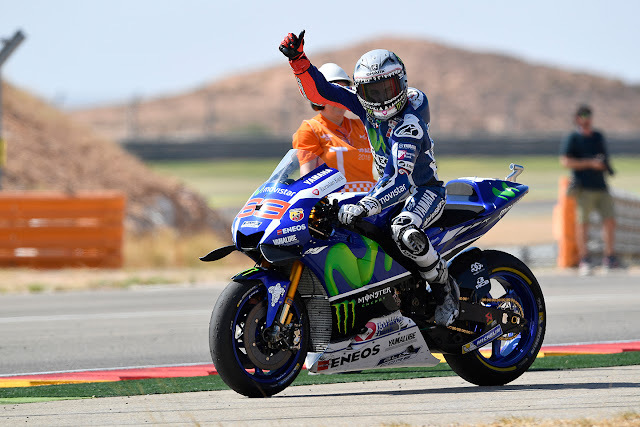 Perhaps that’s Lorenzo’s current problem – he has lost that aspect of front-tyre performance. This year his crew chief Ramon Forcada has torn his hair out trying to adjust the Yamaha M1 to fit the Michelins. He modified geometry to increase front load to generate more heat and therefore grip, but while this works sometimes, other times it creates other problems. The signs at Ducati are mostly good, thanks largely to Gigi Dall’Igna reorganising a race department that had lost its ability to work as a team. The Desmosedici has been mostly competitive this year, but while it was good to see Ducati score its first victory in six years, that success was achieved at the Red Bull Ring, which is essentially three drag strips masquerading as a racetrack with its three consecutive first-gear corners leading onto three consecutive half-kilometre straights. We all know that nothing can live with the Ducati on acceleration, in part because Gigi Dall’Igna’s winglets minimise the anti-wheelie software’s need to cut torque delivery.